In today’s competitive job market, it’s important to look your best. More and more men are electing to have cosmetic surgery, a trend that studies have shown is tied to career advancement. Breast reduction surgery for men is performed by plastic surgeon, Dr. Potter to reduce their overdeveloped breasts. Gynecomastia, a medical word from the Greek words for “woman-like breasts,” affects one out of every ten men. Enlarged breasts on young boys last only a few years and are generally resolved by age eighteen. Enlarged breasts on a man can be uncomfortable, as well as socially and psychologically devastating. During your conference with our physician, explain your goals and expectations of the surgery. Dr. Potter will assess the nature of your breasts and the elasticity of your skin to determine the cause of your breast enlargement. It may be caused by fatty tissue and/or glandular tissue. The doctor or nurse may show you several before and after treatment photographs of patients having similar breasts. Dr. Potter will explain the treatment you can expect to receive and the surgical outcome you should anticipate. Male breast reduction is performed on an outpatient basis using a general anesthesia. The procedure can last from 1 – 2 hours depending on the extent of correction. 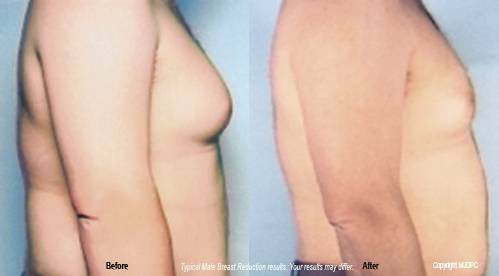 After Dr. Potter performs male breast reduction, light activity is recommended for the first day. You will experience some pain for several days. For the first few days following your surgery, you will wear surgical dressings which will be exchanged for a special compression garment. This will be worn for about two weeks. Most discomfort associated with breast surgery can be controlled with oral medication prescribed by your surgeon. Antibiotics may also be prescribed. Most men experience some degree of swelling, bruising and tenderness. These symptoms should subside in a short time. Within about 2 weeks, all sutures are removed. Your surgeon will advise you on a proper schedule for returning to your normal activities. Most patients are back to work within the first week.